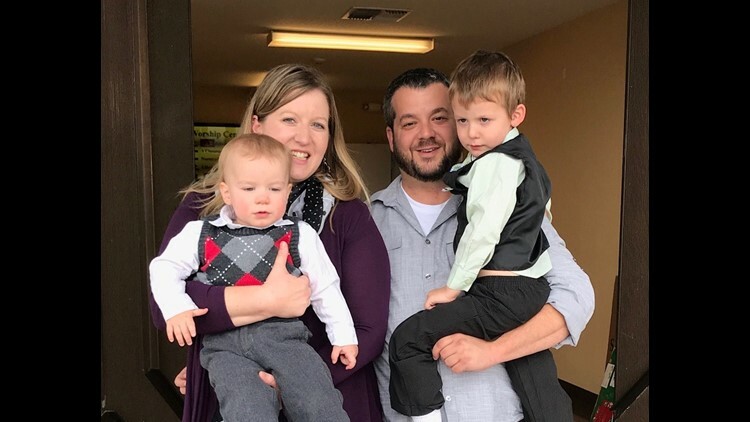 Four-year-old Ezra Brunner, held by father Dave Brunner on the right, was rushed to the hospital by medical helicopter when he stopped breathing. His family was shocked by the huge bill they received. CAMP VERDE, Ariz. — An Arizona family whose son was diagnosed with croup on Christmas day received a $42,000 air ambulance bill — until they objected publicly to the cost that their insurance company would not cover. Ezra Brunner had a sore throat that became a cough by dinner. Then, after he had gone to sleep, he began struggling to breathe. 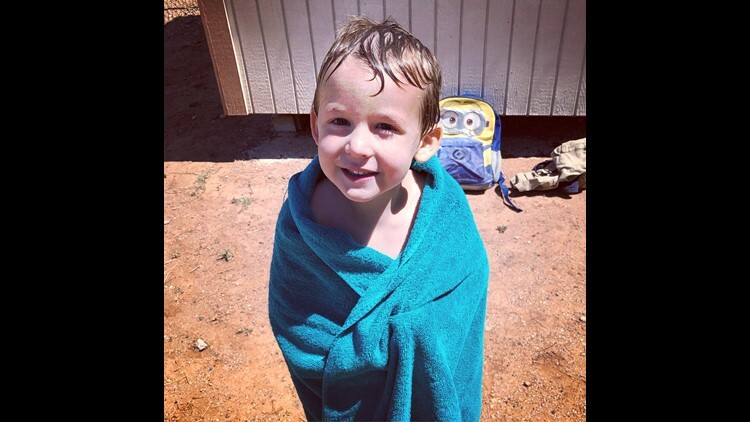 His parents called 911, and a ground ambulance rushed the 4-year-old to the closest hospital from their Camp Verde home. Staff at Verde Valley Medical Center, about 90 miles north of Phoenix, treated Ezra with medicine. But the little boy's condition was critical, and the hospital didn't have a pediatric unit. Doctors recommended he be airlifted to the hospital in Flagstaff, about 40 miles to the northeast. "I heard 'helicopter' and thought, 'That's probably not cheap,' " said Ezra's father, Dave Brunner. But the child's life was in the balance, so the family couldn't wait. Brunner had no idea how right he would be. The bill for the 15-minute emergency flight totaled $47,000. When the family's insurer agreed to pay a fraction of the cost, $5,000, the air-ambulance company came after the Brunners for the rest, billing records show. "I don't want to bankrupt my family," said Brunner, 35, an associate pastor at a small Baptist church. "This company was our only option because of the emergency. ... We had insurance, did everything we were supposed to do, and still are left with a $42,000 bill." Within days of The Arizona Republic contacting the companies about the family’s case and Brunner posting on social media, the air-ambulance company and insurer offered to reduce the bill. But the Brunners aren't alone in this battle. Brunner said he is continuing to speak out because he wants Air Methods, the company that transported Ezra, to change its business practices. "I don't want them to do this to anyone again," he said. Before Ezra's mother, Keara Brunner, climbed into the helicopter with her ailing son, Air Methods required her to sign a form accepting "direct financial responsibility for any unpaid charges" if her insurer denied or underpaid the claim. But the Greenwood Village, Colorado-based company gave her no information at the time about potential costs. The Brunners were charged almost 50% more for the flight than Air Methods stated the same trip would cost under the company’s most recent rate schedule filed with the Arizona Department of Health. The publicly posted rates indicate the Brunners should have been charged $31,598, with a base fee of $19,998 plus $290 per mile. The bill Air Methods sent the Brunners listed total fees of $46,988, including a base of $29,519 and $436 per mile. Air Methods spokeswoman Christina Ward did not answer The Republic’s questions about why the company charged more in the Brunners' case than the posted rate schedule. Because the family’s insurer, UnitedHealthcare, considered Air Methods out of network, the companies did not have an agreement for preset rates. UnitedHealthcare calculated the 40-mile flight was worth $5,000 from the insurer and a $1,300 co-insurance payment from the Brunners, based on market rates provided by a health care cost-comparison company called Data iSight, according to a letter the insurance company sent to the family. Air Methods appealed the decision, but UnitedHealthcare refused to budge. The insurer also wouldn't let the family claim their $20,000 out-of-pocket maximum, Dave Brunner said, because the insurer believed the bill from Air Methods was "unreasonable." "Air Methods has been paid fairly," UnitedHealthcare spokeswoman Tracey Lempner said in a statement. "It is unconscionable they are taking advantage of the Brunner family during a vulnerable time by asking them for additional payment. We will continue to work on behalf of the family to reverse Air Methods’ outrageous actions." Air ambulance companies have come under increasing scrutiny as their billing costs — and profits — have soared. Air Methods, one of the nation's largest medical flight companies, made nearly $100 million in profit in 2016, a fivefold increase since 2012. The company's average charge per flight shot up from $13,198 in 2007 to $50,199 in 2016, according to industry analyst Jon Hanlon of Research 360.Data from 2017 are unavailable because Air Methods went private that year. One reason charges may have increased: The air-ambulance industry has expanded quickly, adding helicopters faster than patient demand has grown, data compiled by Dr. Ira Blumen, medical director of the University of Chicago's Aeromedical Network show. Insurers argue that medical flight businesses use patients as pawns to recoup money from inflated bills. Some companies have used hardball tactics to get patients to pay, including harassing phone calls, hiring debt collectors and placing liens on houses, media investigations have found. Air Methods stopped placing house liens in 2016, said Ward, the company spokeswoman. Air ambulance advocates say flying intensive care units 24 hours a day is expensive, and few flights are fully reimbursed. "We seek every efficiency and innovation to keep costs down," Ward said in email. "However, being ready to deploy our advanced fleet and highly trained clinicians and pilots at a moment's notice requires substantial investment and high fixed costs. In fact, the average cost to operate one base is $3 million per year." As many as 7 of 10 flights are underpaid because Medicare and Medicaid haven’t updated their rates in years and private insurers often refuse to pay full freight, she said. "Insurance companies must step up to the plate and do right by their patients and cover the cost of this critical, emergency health care service," Ward said. On in-network agreements, the blame game goes both ways with insurers and air ambulance companies arguing the other won't accept reasonable fees for service. Each side contends that competing bills in Congress could solve some of the problem. Medical flight operators support legislation that would increase Medicare payments and require transparency around flight costs. Insurers back bills that would give states power to regulate air ambulance fees and clearly separate the medical costs from the transportation costs on a patient’s bill. Both UnitedHealthcare and Air Methods say they employ patient advocates to help people navigate the billing process to reduce charges to patients. But Brunner said no one told him about the resources, and he fought for months on the phone with the companies unsuccessfully. "I realized I would have to get kind of tough with them," he said. So, Brunner reached out to The Republic and vented on Facebook. Soon after, UnitedHealthcare called to offer assistance and Air Methods proposed to settle for a smaller sum, he said. "Everybody got really friendly in the last couple of days," Brunner said, joking. The UnitedHealthcare employee told him she was looking into his case specifically because of the media inquiry. With Ezra back to being healthy and the Air Methods bill on the way to resolution, the family is relieved. But Brunner said he is still troubled that Air Methods hasn’t promised to make systemic changes to reduce the financial burden on patients and their families. And so he said he'll continue to warn others about the company and its practices. "I've always been the type of person, if I see something that looks unfair or unjust, it bothers me," Brunner said. "I start to do everything I can do to figure out a way to help or guard myself or others." Four-year-old Ezra Brunner was rushed to the hospital by medical helicopter when he stopped breathing. His family was shocked by the huge bill they received.